The McMurry Universitiy Warhawks headed to the playoffs in 2016, a place they weren't exactly expected to be, and head coach John Byington explained to TV station KTXS why he believed the team made it. "I think it was simply having all three aspects of our game on spot, the hitting, the pitching and the defense," Byington told the station. "Everyone knew what we were up against, and it's always in the back of your mind, that kind of thing but use that fear as a way to have a greater desire to accomplish." Years earlier, Byington had his own hitting on spot enough to make the pros in seven seasons. He made AAA, but not the bigs. As a college player, on one day in particular, he had his hitting on spot enough to become a local legend. Byington's career in baseball began 1989, taken by the Brewers in the third round of the draft out of Texas A&M University. At Texas A&M, Byington earned All-American honors. He picked up 96 hits in 1987, 17 of them home runs. In 1989, he hit 15 of those home runs, posting a .442 average in the process. He hit two of those 1989 home runs on a single day - both walk-offs - in a double-header against rival Texas. Byington hit a walk-off grand slam for the top-ranked Aggies in the first game and a three-run shot to walk off in the nightcap. "I have had game-winning hits before, but to do something like that against your arch-rivals is unbelievable," Byington said after game two, according to TexAgs.com. "This is what you think about at practice, coming to the plate against Texas in the bottom of the ninth. That is as good as I can hit a ball right there." Aggie writers continued to remember that day a quarter century later. A clip of the second walk-off is on YouTube. 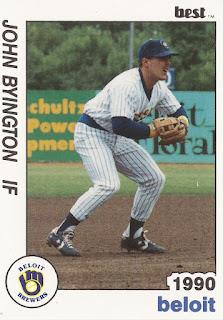 Byington started with the Brewers at single-A Beloit. He hit .208 in 44 games. He returned to Beloit for 1990, improving his average to .263. He made AA El Paso for 1991 and 1992, hitting .273 and .306 respectively. He knocked a bases-loaded, 12th-inning single to win a July 1992 game. He won all-star honors that year. 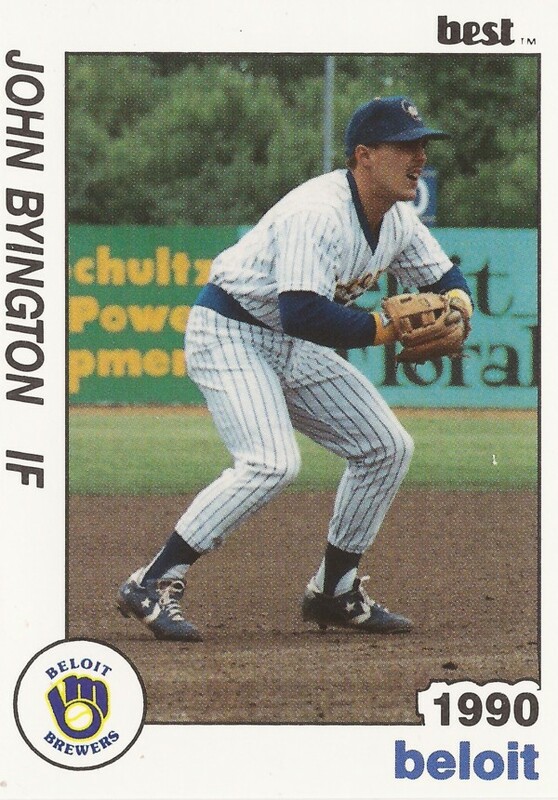 Byington made AAA New Orleans for 1993, playing there into 1995. He hit a run-scoring double in an April 1994 game. He then played the rest of 1995 with AAA Oklahoma City. He picked up three hits in a June game. That season, however, turned out to be his last as a pro. Byington started coaching in 1996 as a student assistant at Texas A&M. He arrived at McMurry in 1998 as an assistant coach, then took the top job in 2009 and continues in that post in 2017.